It's difficult to imagine more disparate starting points for seasons than the San Antonio Spurs have had these past two autumns. Last October, San Antonio had to leave behind a crushing finish, catch their breath after that sucker-punch ending, and get back to climbing. This time, revenge and a ride down the river in their rearview, the Spurs must forget they bagged the big prize and keep living like hunters. You'd forgive the Spurs for feeling that way after responding to their 2013 disappointment with an NBA-best 62 wins; after vanquishing the Oklahoma City Thunder, who had snuffed out San Antonio's 2012 title hopes; and after annihilating the two-time-defending champion Miami Heat, an exclamation-point exorcism featuring some of the most beautiful basketball we've seen in years that gave Popovich and Tim Duncan their fifth championship in 17 seasons together. Success breeds satisfaction, which can breed stagnation. For the Spurs to accomplish something they haven't in this legendary run — a successful title defense — Popovich can't allow that. “You got to keep up with it, because teams change, players’ careers change and the makeup of the team changes," he told Michael Lee of the Washington Post. "Standing pat never works." The Spurs seemed to do just that this summer, re-signing all of their own free agents rather than looking outside for upgrades. They're betting on continuity and chemistry, and that there's enough room for internal growth — from Danny Green, from Tiago Splitter and Boris Diaw and, above all, from Kawhi Leonard — to prevent looking like a faded facsimile of last year's model. Regardless, repeating will require Duncan, Tony Parker and Manu Ginobili to stay healthy and effective. That could require Popovich to again stretch his minutes management to degrees nobody else dares, as he did last season, when the Spurs became the first NBA team ever on which no player averaged 30 minutes per game. On other teams, such restrictions, and their depressing effect on players' statistics, might spark dissension. 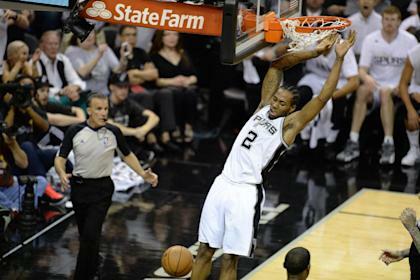 In San Antonio, though, everyone buys in because they believe in the guy setting the limits. Commonality of purpose can carry a team a long way. But can it carry the Spurs through another season atop the West and to a third straight Finals? Still pissed. Should have been a sweep. Sure, if you're into the whole "bring back the entire championship team" thing. The 30th pick in the 2014 draft brought Kyle Anderson, who seems tailor-made for San Antonio. The 6-foot-9 point forward averaged just under 15 points, nine rebounds and seven assists per game during his final season at UCLA, and while his measurables won't set evaluators' hearts aflame, "Slow-Mo" ought to fit in just fine ... when he's ready. Gregg Popovich on most of last year's team coming back: "Well, we had a pretty good year. Didn't see any reason to kick them out of town." San Antonio retained Diaw on a frontloaded (and incentive-laden) four-year, $30 million deal. The Spurs' other off-the-bench Finals star, Patty Mills, saw what might've been a big payday scuttled by a torn rotator cuff, instead returning on a three-year, $11 million deal. Crowd favorite Matt Bonner, to whom Pop turned to unlock the Serge Ibaka-led Thunder defense in the Western finals, received a one-year, veteran's minimum deal to shot put triples and be fun. After averaging nearly 17 points per game to pace Australia at the 2014 FIBA World Cup, Aron Baynes accepted a $2.1 million offer to spend another year bruising opposing bigs. Buford got a jump on next summer's work, too, inking Parker to a three-year, $43.3 million contract extension. While the Spurs gave their All-Star point guard the biggest extension they could, they still struck a cost-effective deal, considering the king's ransom he could've commanded in free agency next summer. Instead, they'll keep him in silver and black through 2018, and keep intact the roster that ran roughshod over Miami for another run this year. Given the return of the full title squad, let's note a couple of additions who won't play a minute — assistant coaches Becky Hammon, the first full-time female assistant in NBA history, and Ettore Messina, whose coaching résumé includes multiple championships in Italy and Russia, as well as four Euroleague titles. [Messina] recalls Popovich telling reporters after the Spurs played Messina's CSKA [Moscow] club in a preseason game last October that he would make his players watch film of the entire game because Messina's players understood the free-wheeling style better than the Spurs. After losing longtime lieutenants Mike Budenholzer and Brett Brown to head coaching jobs last season, Popovich looked beyond convention to round out a staff that already includes shot doctor Chip Engelland, player development guru Chad Forcier, lead assistant Jim Boylen and rising star Ime Udoka. The Spurs believe both Hammon and Messina can bring new energy and ideas to a franchise forever searching for edges to help maximize its roster. In a league where the margin between agony and ecstasy can be razor-thin, that fresh perspective might be the most meaningful addition San Antonio could have made. None. That tends to be the case when you return 97.5 percent of the minutes from a 62-win champion that ranked sixth in the league in points scored per possession and fourth in points allowed per possession, that was nearly as good on the road (an NBA-best 30-11, outscoring opponents by 6.5 points per 100 possessions) as at home (32-9, +9.7-per-100), and that's still led by the NBA's best coach. Sure, there are things that bother the Spurs — Ibaka, mostly, but also the "clever" Rick Carlisle, a non-cramping LeBron James, a healthy Dwight Howard (who averaged 18 points and 16 rebounds per game against the Spurs last year), etc. There's also the fear that the 38-year-old Duncan and 37-year-old Ginobili will finally collapse beneath the accumulated wear, tear and weight of the history they've created. Maybe Diaw's commitment wanes after getting paid, and maybe Green and Marco Belinelli press in pursuit of paydays during their contract years. Maybe Cory Joseph can't capably back up Parker while Mills recuperates, and maybe San Antonio's health luck will turn after losing the league's fifth-fewest games to injury last season. It wouldn't be shocking to see the Spurs fall short of last season's 38-14 conference mark in a brutal West. It's tough to improve upon a championship; the Spurs could well be worse. But "glaring" weaknesses? Nope. “I’m probably going to talk to him more about consistency now,” Popovich said. “He’s reached a certain level and if you look at those last three games he played, they were pretty special. But to be in that top echelon of players in our league, it’s a huge responsibility to have to come and do that every night. The Duncans, the Durants, the James-es and all those kinds of guys do it night after night after night, and it’s a huge responsibility. Pop probably wouldn't mind if Leonard returned from his killer vacation sporting the Legend's court vision and playmaking sense, of course, but that's not exactly stuff you add over the summer. Instead, as Sports Illustrated's Rob Mahoney suggests, it's more likely Leonard's game grows in subtler ways — a few more chances to attack rather than swinging the ball, a few more opportunities to make plays that in the past would've belonged to Duncan and Ginobili but now fall to fresher legs. (Leonard begged off Team USA duty, in part, to prepare for a greater workload.) It'd be a natural extension of the increased role he took on late last season; after returning from a broken bone in his right hand, he averaged just under 15 points in 30 minutes per game on 53/44/86 shooting splits over the final 25 contests. Pop's not going to call iso after iso for Leonard to launch the midrange fadeaway he's apparently been working on; the system's the star and the ball can't stick. But Leonard will get opportunities to carve out a larger piece of the pie, to prove he's closer to the havoc-wreaker of the Finals' last three games than the passive participant of Games 1 and 2, and to validate those "face of the franchise" predictions. Now comes doing it nightly. Joseph. With Mills likely sidelined until January, the fourth-year guard out of Texas enters the season as Parker's backup. He's taken on a larger role for stretches before — an eight-game starting stint in March 2013, a month-and-a-half-long run this past winter, both coming while Parker was hurt — but this marks the first time he's been the clear No. 2. It's a welcome shift for a player who spent his first two seasons shuttling between San Antonio and Austin on D-League assignments. But it also means more responsibility and pressure for the 2011 first-round pick, who's regarded more as a defensive presence than an offensive initiator. Pop sounds confident in the Toronto native — “He’s done well in that role in the past, so I look forward to him doing that again" — but he also knows he's got his bases covered, with Parker coming off a summer without national team duty and Ginobili (ditto, regrettably) on hand as his top reserve playmaker. That said, putting too many minutes on their legs early in the season could have negative repercussions later, and it'd serve San Antonio well to be able to ease Mills back into the fold after his surgery. Whether Joseph can hold up could have a greater impact on the Spurs' regular-season record, and thus their repeat hopes, than you'd think. The marriage of opportunity, responsibility and contract status — Joseph faces restricted free agency this summer if he doesn't agree to terms with the Spurs on an extension by Oct. 31 — make this a make-or-break season for the 23-year-old. He might not look at it like his big chance, but it is — a chance to prove his flashes of attacking prowess point toward something bigger, and to show that he's worthy of a real rotation role in the future, in San Antonio or elsewhere. The greybeards enjoy another year in the sun while the up-and-comers shoulder a greater load. The injury luck actually improves — remember, they lost Splitter, Green, Leonard and Ginobili for weeks last season — allowing for even greater coherence on both ends. Pop keeps his roster rested but sharp through a 16th straight 50-win season while still earning a high playoff seed. The Western bracket unfolds in their favor on the way to the sixth title in franchise history, and Duncan and Ginobili end their careers with their first-ever back-to-back championships. This really is the year Duncan and Ginobili fall off. Leonard, Splitter and Green falter when pressed into primary roles. The reserve corps that thrived last year sputters without Mills' instant offense, as Diaw gets complacent after getting paid, Belinelli's career-best '13-'14 shooting percentages regress and Joseph can't handle backup duties. The West's rising tide swallows the Spurs, who sink to the bottom of the bracket and get washed out of the postseason in Round 1 for the first time since 2011. 57-25, good for a fifth straight Southwest Division title and the West's No. 3 seed.